This baby quilt is for Milas the baby boy of a friend. I already made a quilt for her firstborn daughter Felia and immediately decided I wanted to sew another quilt when I heard the good news. We picked this layout idea. 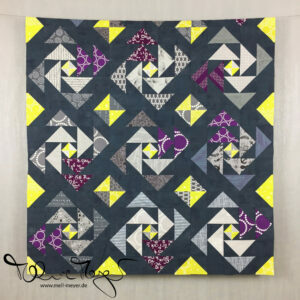 That picture is the reason for the strange working title I used in the beginning: speedsign quilt. The color inspiration came from this. Here is the list of „problems“ – broke up by some more nice pictures. I don’t want to grumble but show you that we all struggle at some or sometimes more points in the journey. (2) During basting I realized that I misscut all the pieces to the finished size. Yeah, easily fixable, add a wide outer border. (3) Then the requested batting didn’t work out at all. Just buy new batting and rebaste the quilt. (5) The newly acquired batting was really fuzzy. The whole quilt top and quilt back were covered in lint before I was even half way through the quilting. I fixed this with cutting the backing and batting down to the quilt top size and pinning a folded strip around the whole quilt to stop it from shedding more fluff. Don’t you enjoy an extra step? (6) Then the backing started to pucker, a lot! I unstitched three or four quilt lines and rebasted that part, again. (7) With all that rebasting the backing fabric shifted too much, so I had to cut down the outer border strip to roughly half its size to have the whole quilt covered with backing. It might be smaller than planned but it is not the size that matters with gifts, right? Is any of this really important in the end? Not to me. Though it might be a bit funny when you tell the story so exaggerated. 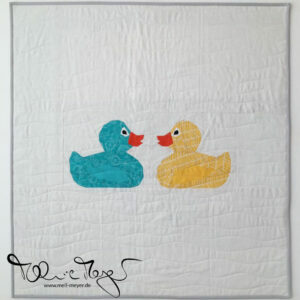 Everything is true but isn’t it normal for most quilters to change designs or fix „mistakes“ in between? And the most important thing is that Milas now has his own baby quilt to rest and play upon, to cuddle and find warmth and shelter. This is my second finish from my Q4 FAL list so I will link up there later. This quilt is beautiful!! I love the colours!! Sounds like this quilt really tested your patience! It looks great, I love how the colours look on the dark background. 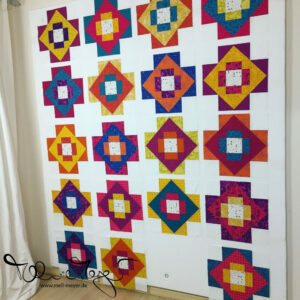 I love how this quilt started to have it’s own story once the colors were grouped together. What a powerful impact!?! Little Milas will need this nice snuggly quilt in this weather! Congrats on the finish! I love your quilt! The colors, the style, everything! I’m sorry it was such a pain, but sometimes that can lead to the best results.